Hello sweet friends. How was your Valentine’s Day yesterday? In honor of the sweetest day of the year, mom/dad shared a little love yesterday as well. They went out to dinner and afterwards enjoyed this delicious concoction. And hey, splitting a dessert means half of the calories, right? But who’s counting calories on Valentine’s Day – snorts. 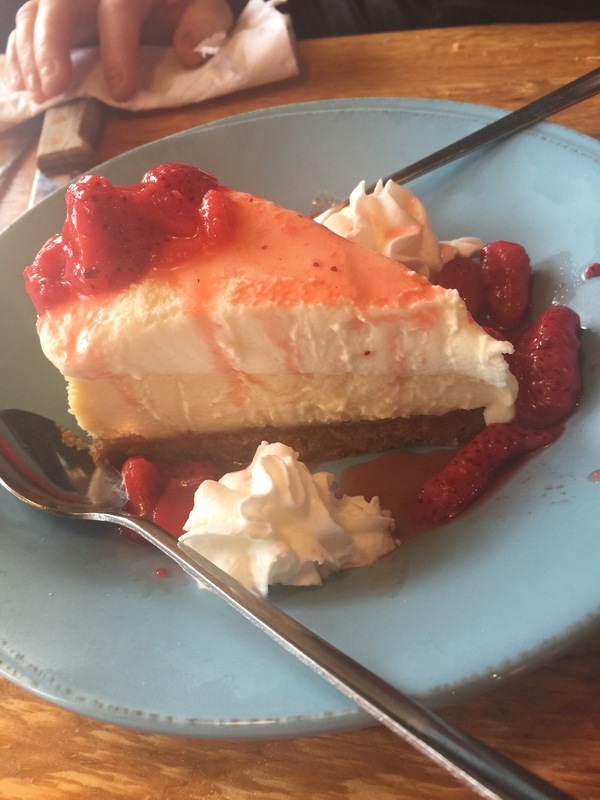 This lovely creation is called a Margarita Cheesecake which is seasonal special at a local steakhouse called Logan’s Roadhouse. Now, it’s like other cheesecakes made with cream cheese but it has Logan’s signature margarita blend on the graham cracker crust. And don’t forget about the sliced strawberries all over the place. Mom said it was – what was the phrase she used – delightful to the fullest! So, if you are near a Logan’s Roadhouse, make sure you check it out for this wonderful dessert. You won’t be disappointed. Today we continue our travels in the south series. I’m going to take you back to Tybee Island, Georgia. Why? Because that happens to be one of the places in the entire world that mom/dad can get to for an escape of reality to find inner peace. You believe that, right? Snorts with piggy laughter. So there mom/dad was in one of the many stores on Tybee Island, wondering around aimlessly looking for ‘it’. You do know what ‘it’ is, right? When woman know they need something but can’t quite put their manicured finger on what it is they need. You follow me now? So there they were in this store, mom looks up and says to dad, “There it is!” Oh dear have mercy is what I think dad mumbled. What was it? Take exhibit A in the picture to the left. For a moment mom thought they were in the South Pacific on Easter Island. Where else would they be finding this ‘dude’? You know Easter Island – There are mysterious moai statues that are huge – averaging 13 feet and weighing 14 tons. Although they stand silent reaching for the stars, they speak volumes on how did they get there and how were they constructed which to this day is a mystery. So was mom surprised when she found “Junior” here on Tybee Island, Georgia of all places. Now, mom thought Junior would be awesome standing either on her front porch here at the Hotel Thompson or on the deck. See, mom’s weird like that. And I’m sure us anipals would have endless nightmares of Junior chasing us in our sleep. So, this is the one time that I can say dad talked some sense into mom… this time. But if Junior is still there the next time mom/dad visits the island, I can’t promise it won’t come home… yay. 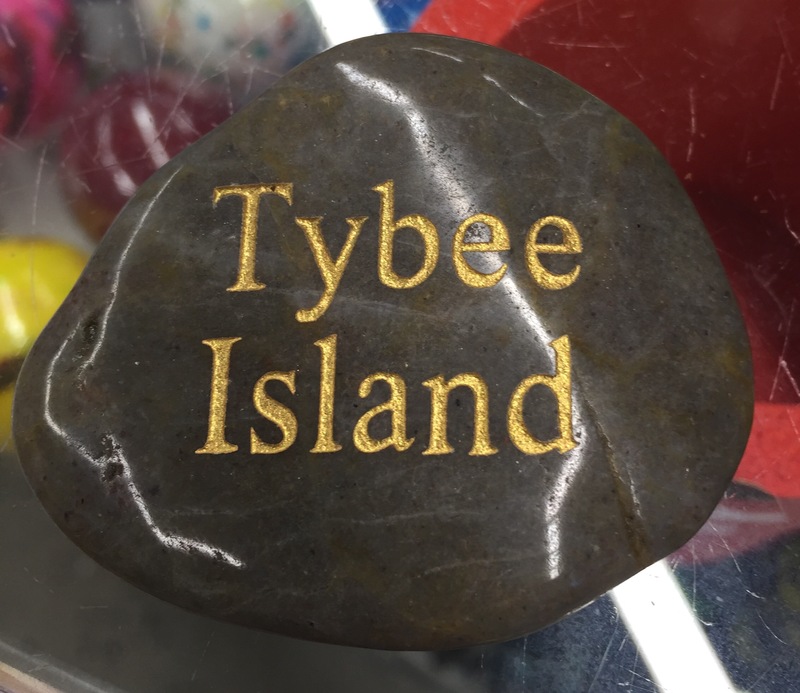 And another “it” that mom found while shopping endlessly for nothing, was a treasured Tybee Island rock. You know this rock did make it home to the Hotel Thompson and is now treasured with our other pet rocks. They all get along and have been talking non-stop about the beach and the fantastic water. I foresee a pet rock excursion taking place to Tybee Island in the near future. Do you? For obvious reasons, Bacon doesn’t need to see this. This creation is one of mine and Jim’s favorite breakfast foods while visiting Tybee Island. We even introduced it to Jean/Bill from Canadian Cats and to Fozziemom/Fozziedad from All Fur One and One Fur All when they visited. 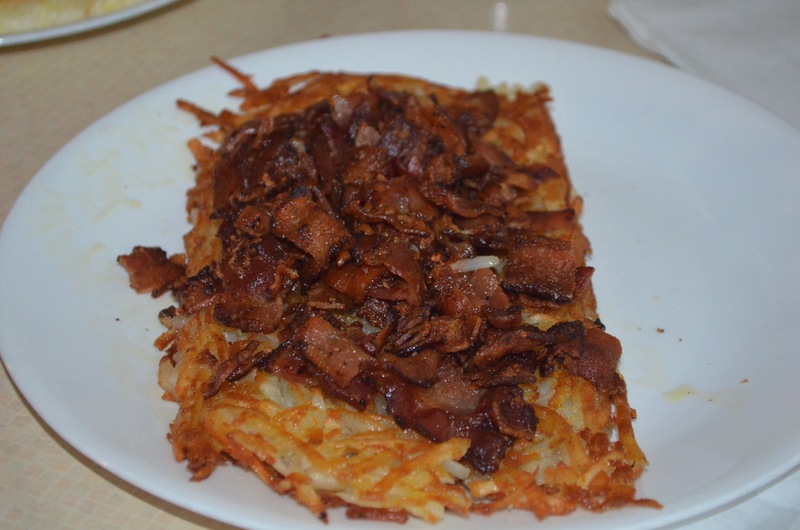 It is hash browns well done crispy sprinkled with chopped up fried bacon. See, that’s why Bacon didn’t need to see this. It is insanely evil and so delicious. You won’t look at plain hash browns the same way.